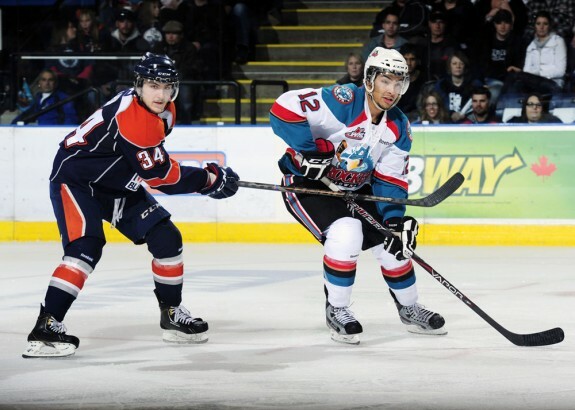 Draft eligible for the third and final time in 2013 is Kamloops Blazers winger JC Lipon. The performance of Lipon this season has turned a few heads and opened many eyes, but also led to a bit of discussion regarding how to gauge the performance of one of the older draft-eligible players in this year’s class. The question regarding Lipon is this: if you’re an NHL team, do you draft an-almost 20-year-old player whose development path is shorter and is closer to a finished product, or do you use that pick on an 18-year-old with upside? And if you pass on Lipon, what are the odds that another team won’t snap him up and he’ll be available as a free agent following the draft? Lipon was first eligible to be drafted following the 2010-11 campaign, where he had 21 points as a 17-year-old. Nobody took him. In the 2011-12 season, he had 65 points and was passed over once again. This season, competing as a 19-year-old, he’s racked up 89 points and made Canada’s roster for the World Junior Championships. All while playing on one of the most complete teams in Canadian major junior hockey. The best way to assess Lipon is probably to compare him with the other high-end 1993 birthdays in the WHL. While he was sixth in scoring among his age group, when you account for the games he missed due to the World Juniors, he’s third in points-per-game behind St. Louis Blues pick Ty Rattie and Colorado Avalanche pick Colin Smith. Smith may be the better comparison, as he was over-looked in the 2011 draft but was chosen by the Avs in the last round of the draft on the strength of a 50-point season as an 18-year-old. As for Lipon himself, he’s a very good skater, has good hands and a nose for the net. Most impressively, he battles every shift. You could argue that he may not have NHL talent, and many will argue that he does boast some NHL-level attributes, but he most definitely has NHL work ethic. NHL Central Scouting rated Lipon the 96th-best North American skater eligible for selection. It’s incredibly unlikely that the main intangible holding him back – his age – keeps him off the board for a third straight draft. But his age may keep him off the board for a few rounds, at least. Lipon represented Team Western Canada at the 2010 World Under-17 Hockey Challenge. He also suited up for Team Canada at the 2013 World Juniors. He failed to win a medal in either appearance. If all goes well, Lipon projects to become a strong bottom-six winger with a possible second-line ceiling. If all goes well, Lipon could turn into something resembling Brad Boyes or Blake Wheeler. Most likely, Lipon will be chosen in either the late first round or in the first half of the second round.